A Sam Houston State University student has been selected as the first Texas State University System Regents’ Scholar. Sahabia Ahmed, a senior economics and international business major from Tanzania, was selected by the system chancellor based on her outstanding academic achievement and scholarship in her studies, strong commitment to and leadership in co-curricular activities, and notable contributions to her university and community. In addition to a framed resolution and medallion, Ahmed was awarded a $2,500 scholarship at the TSUS Board of Regents meeting held Nov. 16 on the SHSU campus. Frank Parker, vice president for student services at SHSU, suggested the idea of a system-wide recognition for an outstanding student each year. “There are approximately 78,000 students who attend schools in the system,” Parker said. “Notices were sent to all the peer institutions requesting nominations for those students who were deserving of the award. 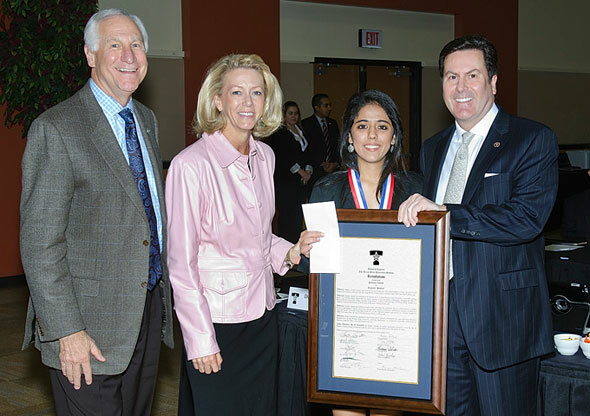 It speaks very highly of Sahabia to be selected as the first Texas State University System Regents’ Scholar. Ahmed, who has a perfect 4.0 grade point average, has been the recipient of numerous awards and recognitions during her time at SHSU. In addition to being named to the Dean’s List and President’s Honor Roll every semester, she has been awarded a College of Business Administration summer scholarship, Elliott T. Bowers Honors Scholarship, Undergraduate Academic Achievement Scholarship, the Mary Alice Mays Scholarship, Farm Credit Bank Scholarship, Beta Gamma Sigma Scholarship, the Assam Scholarship, and the William B. Green International Business Scholarship. Her essay on Sam Houston State University’s motto, “The measure of a Life is its Service,” was recognized as the “Best Freshman Essay” in a contest sponsored by the SHSU Writing Center in 2011, and she won an award for her entry in the Undergraduate Research Symposium earlier this year. Ahmed is president of the International Student Organization; student adviser for the Nepalese Student Association; a student in the Elliott T. Bowers Honors College; an economics and business analysis tutor for the SHSU economics department; and a member of Beta Gamma Sigma International Honor Society for students in the business disciplines. She was the organizer of the SHSU International Festival held on campus in the spring and serves as the SHSU student leader for “Course Hero,” an organization that donates books to Africa. She also works for the university’s Counseling Center as a note-taker for visually impaired students. Following her graduation from SHSU, Ahmed plans to attend law school in the United States and become a corporate attorney before returning to Tanzania.